This is one of those “neighborhood” restaurants. You don’t often go because it’s “right there” and you can go any time. Last Saturday, my wife Kathy and I, along with our friends Jerry and Sue C., decided this was the “any time”. 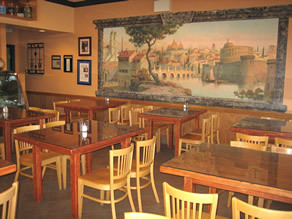 Actually, we didn’t feel like traveling very far and the proximity of Pasta Pomdoro made it a good choice. I grabbed a bottle of wine from my rack and we drove the 6 tenths of a mile to our destination. We had a short wait outside for a table to open up but within 5 or 6 minutes we were seated in the crowded restaurant. Kathy and I had been there a couple of years ago but neither of us could remember how we felt about our meal on that one occasion. 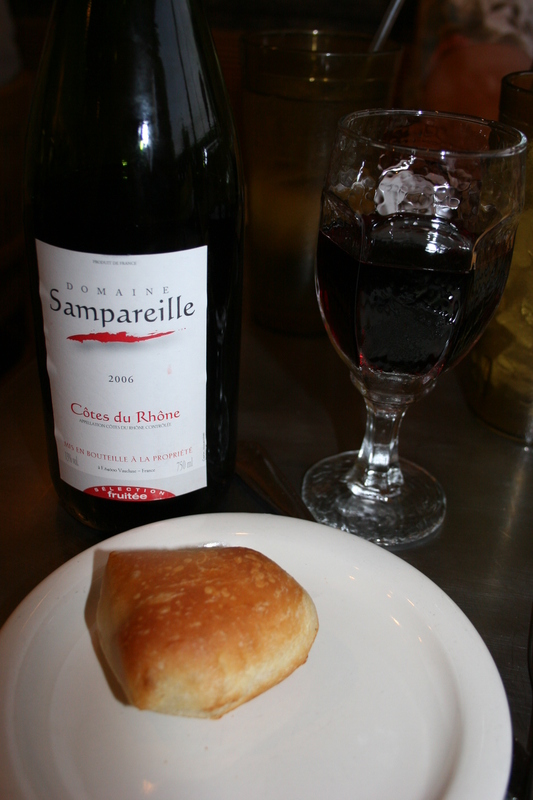 My wine was the 2006 Domaine Samparielle, Cotes du Rhone, Selection Fruitee. I often say if you are looking for a French wine and want something decent without spending a small fortune, it’s hard to go wrong with just about any Cotes du Rhone. I’d now like to amend that statement to read “any Cotes du Rhone that does not say “Selection Fruitee” on the label.” This one just lacked body and structure and was a major disappointment. Hey, what fun would it be if every wine was terrific? We were served nice, warm rolls with butter as our server, Mallory, told us of the evening specials. 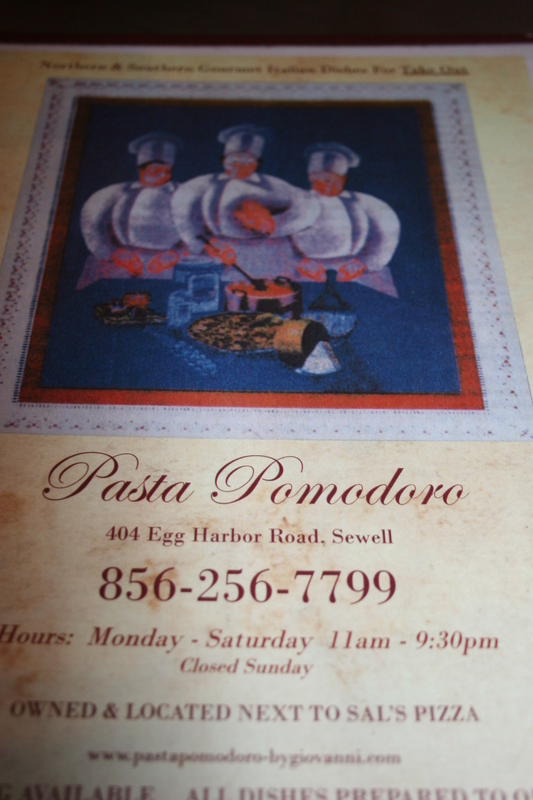 The menu at Pasta Pomodoro isn’t fancy but there are plenty of items to provide a good selection. Five or six very healthy sized croutons appeared buried under an avalanche of bright red tomatoes. Jerry thought the croutons were too big and naturally the tomatoes fell off the bread. He ate a couple of pieces and brought home enough to feed a third world country for 4 or five weeks. This was an example of serving quantity over quality. 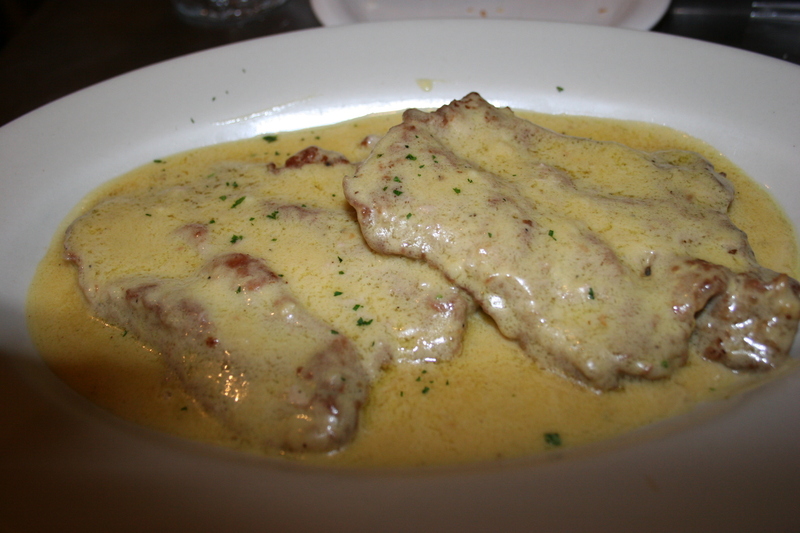 For my entree, I wandered from my usual comfort zone and chose the Veal Mustard, tender veal sauteed with garlic and topped with a creamy Dijon mustard sauce. This was accompanied by a penne pasta with red sauce. The veal was tasty enough but I should have asked for veggies to go with the dish as the red sauce didn’t go well with the Dijon mustard. I took some of the veal home for lunch the next day. Jerry selected the sexiest sounding item on the menu, the Bandolini Montebianco, let me type that again it sounds so good, the Bandolino Montebianco, a six cheese filled pasta purse (we couldn’t think of what the six different cheeses could have been), tossed with asparagus, garlic, fresh tomato and white wine, covered with mozzarella cheese and baked in the oven. 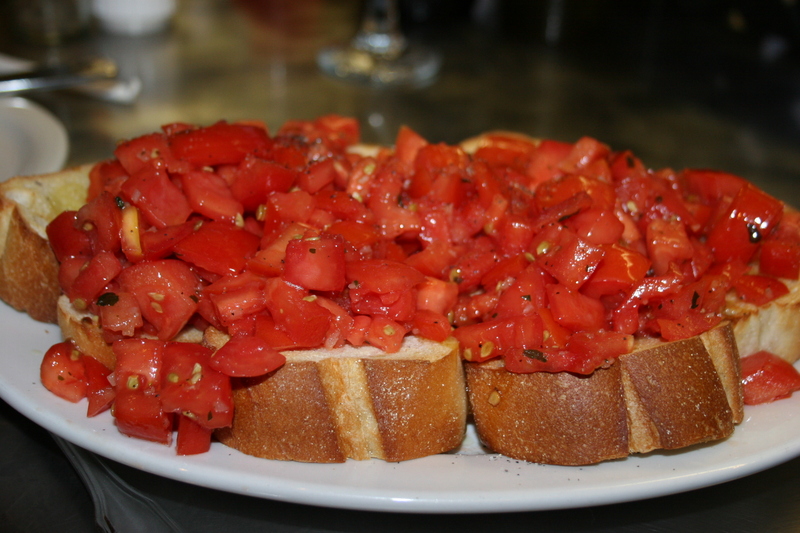 The cheese filled pasta purses were delicious but this was the type of food that quickly fills you and Jerry had plenty to take home along with his bruschetta. 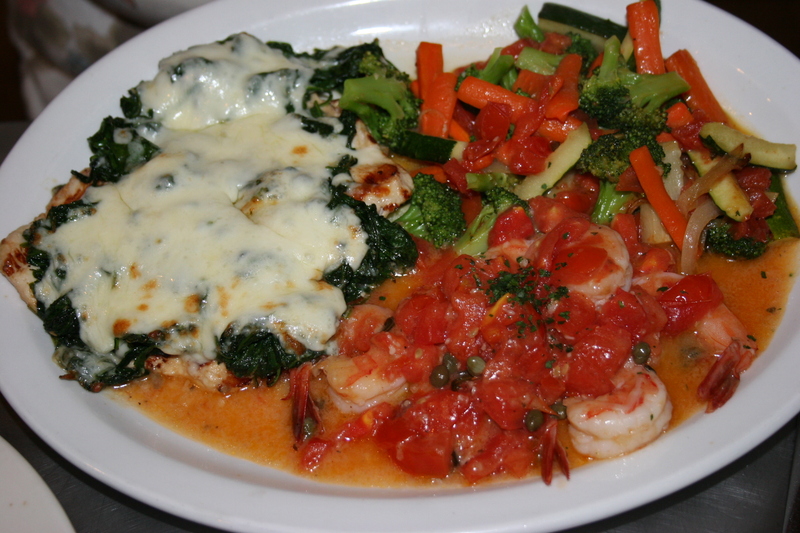 Kathy had one of the evening specials which were two grilled chicken breasts topped with spinach and mozzarella along with some shrimp in a tomato sauce with a medley of garden vegetables. This was another large portion that left her with enough for another meal. 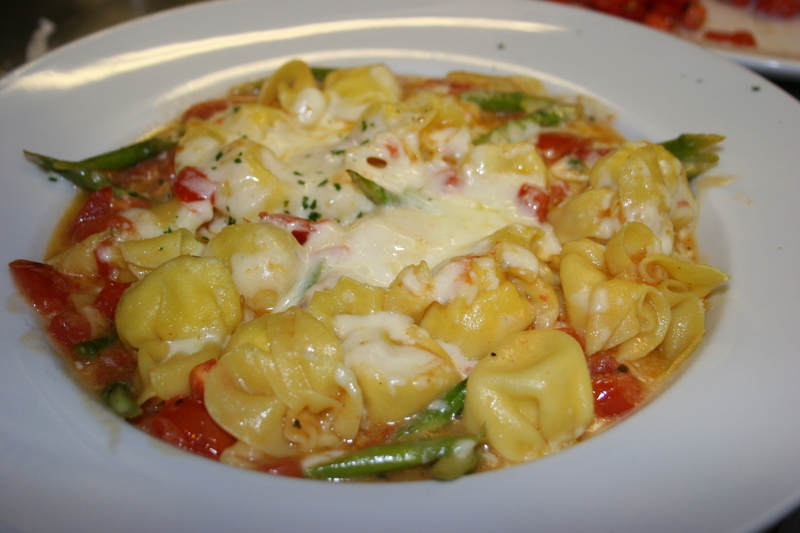 Overall, I would have to give pretty good marks to the food at Pasta Pomodoro. 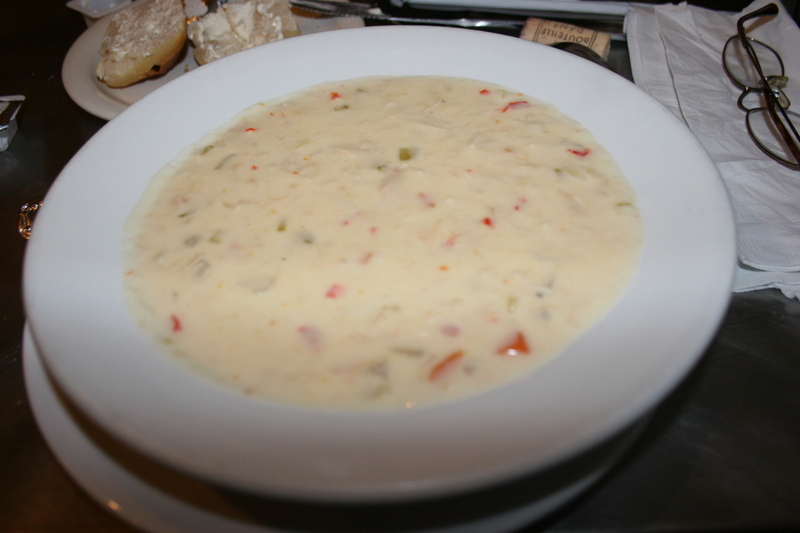 It was much better than I had anticipated with the crab chowder being a match for any being served in the area. The prices are very reasonable and the four of us walked away impressed with this local dining establishment.